In 1512 Pope Julius II tried to explain why the Christian Bible failed to mention the American Indians and their continent. He declared that although the Indians were descendants of Adam and Eve, and therefore human, their ancestors were Babylonians who had been expelled from the Old World on account of their sins. God had apparently lost sight of them, and somehow they had managed to survive the flood. The theory of the peopling of the Americas that became scientific orthodoxy in the mid-20th century is no less fabulous: the Americas were empty of humans until about 14,000 years ago when migrants from Northeast Asia trekked over the Bering land bridge, and with the exception of a brief visit by the Vikings in the 11th century, the first person to subsequently discover the Americas was Christopher Columbus in 1492. More recently, the possibility of migrations up to several tens of thousands of years earlier than 14,000 BP has been accepted by many scientists. There is evidence, however, that North, Central, and South America were settled by migrants from different parts of the world over the course of millions of years, and that even in the past 5000 years explorers and traders from various continents visited the Americas before Columbus. History books tell us that Christopher Columbus – also known a Cristóbal Colón – ‘discovered’ America in 1492. His voyage across the Atlantic was financed by Queen Isabella of Spain, as he had failed to win the backing of King John II of Portugal. Columbus landed on one of the Bahama islands in the Caribbean, but was convinced he had reached the Indies (or ‘Spice Islands’). On his way home, he visited King John II to boast of his success in discovering a shortcut to Japan, China, and King Solomon’s gold mines, but he was told that his voyage had only taken him to ‘Antillia’ (the Antilles), which was already known to the Portuguese, and that there was mainland located directly south of these islands – a continent not shown on any publicly available European map of the time. According to the 1st-century geographer Diodorus Siculus, Iberians in the Spanish Peninsula and the Phoenicians of North Africa had learned about a huge paradise in the far western Atlantic about 1000 BC. By some accounts, the western isles were part of an Asian continent – known as ‘India Occident’ or ‘India Superior’. Some Greek and Roman scholars thought there were only small islands across the Atlantic, known in folklore as the Fortunate Isles, the Gorgades, and the Hesperides. A 5th-century Roman map by Macrobius shows the Gulf of Mexico and the peninsula of Florida, but as part of the Asian/Indian mainland. They are shown in the same way on several 15th-century maps published by the Portuguese. Portugal’s ruler Prince Henry the Navigator and his successor King John II sent numerous expeditions into the western Atlantic, beginning in 1418. These voyages were shrouded in secrecy, and not all the discoveries were shown on published maps, which were often designed to mislead commercial rivals and conceal the existence of unknown lands and lucrative resources. According to Ferdinand Colón, Columbus’ son and biographer, the Portuguese had succeeded in reaching Antillia by 1430. Moreover, maps produced by the Portuguese Andrea Bianco between 1436 and 1448, but not made public at the time, show the approximate locations of Newfoundland, Florida, and even Brazil. Yet later Portuguese maps, published in 1459 and 1489, depict Asia with a southeastern macro-peninsula (Florida) but nothing corresponding to South America. Fig. 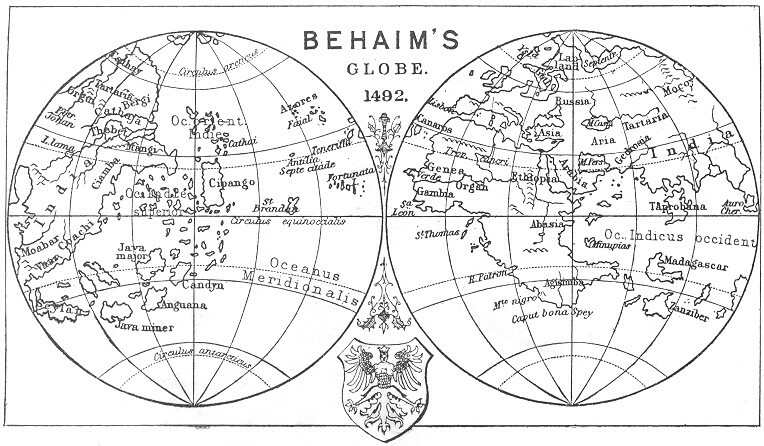 2.1 Behaim’s globe (1490-92) represents the prevailing geographical misconceptions of explorers such as Columbus. After examining copies of Behaim’s maps, colonial statesman Benjamin Franklin concluded that Behaim was the true discoverer of America. Behaim, a German expatriate, began working for the Portuguese in 1482. But Andrea Bianco’s 1448 map confirms that the Portuguese had already begun mapping the South American continent. However, it was not until the voyages of Amerigo Vespucci (Americus Vespucius) from 1499 to 1502, working for King Ferdinand of Spain, that the existence of what Vespucci called the ‘New World’ was made public in Europe. Soon afterwards, the German cartographer Martin Waldseemüller named the southern continent ‘America’ in honour of Amerigo,* and Flemish cartographer Gerhard Mercator later applied the same name to the northern continent. Columbus admitted that he carried a map with him on his 1492 voyage showing the route to the ‘Indies’. Many other explorers admitted that they had maps showing the places they ‘discovered’: the Strait of Magellan below South America in the case of Ferdinand Magellan; Brazil in the case of Pedro Álvares Cabral; the cape of South Africa in the case of Vasco da Gama; and Australia in the case of Abel Janszoon Tasman. It seems that the whole world had been charted in at least some detail before the Europeans set out on their ‘voyages of discovery’. From the 9th to 12th centuries the Norse Vikings were the masters of the Atlantic. The settlement of Greenland was begun by Eric the Red in the late 10th century, when most of the earth, including the Arctic, was warmer than today. Around 1000 AD Eric the Red’s son, Leif, led an expedition to rediscover lands that were known to exist to the west of Greenland. The region in which they settled was named Vinland, which probably corresponds to modern Newfoundland. The Norse discovery of America is the only claim, other than Columbus’, to be fully accepted by modern historians. It was only after excavations at L’Anse aux Meadows in Newfoundland provided physical proof that academics stopped dismissing the Viking sagas about such voyages as fairytales.5 However, they continue to dismiss any evidence that the Vikings travelled further than Newfoundland, or that they initially discovered America hundreds of years before 1000 AD. Evidence of even earlier voyages to the Americas is outlined in the next three sections. It appears that voyages to the Americas have been taking place from all parts of the world for countless thousands of years. The predominant aim seems to have been trade and exploration or the establishment of local colonies, rather than large-scale military conquest and the subjugation and conversion of ‘inferior’ races, as was the case with the European invasions in the 16th and 17th centuries. However, orthodox historians and archaeologists are still clinging to their isolationist preconceptions, and refuse to accept the evidence for widespread cultural diffusionism and intercontinental trade. They tend to vigorously defend their own specialist fields against ‘interference’ from outsiders, and generally feel no incentive, or lack the knowledge, to recognize common cultural traits. Where similarities are acknowledged, they are automatically attributed to ‘independent invention’. 1. Gunnar Thompson, Secret Voyages to the New World: Nine true adventures from the forbidden chronicles of American discovery, Seattle, WA: Misty Isles Press, 2006, pp. 173-97; Gunnar Thompson, ‘How the Portuguese out-foxed Columbus’, in Frank Joseph (ed. ), Unearthing Ancient America: The lost sagas of conquerors, castaways, and scoundrels, Franklin Lakes, NJ: New Page Books, 2008, pp. 234-43; Gunnar Thompson, From ‘fantasy isles’ into continents: how myths became realities at the hands of Portuguese cartographers, www.marcopolovoyages.com. 2. H.P. Blavatsky, Isis Unveiled, Pasadena, CA: Theosophical University Press (TUP), 1972 (1877), 1:591-2. 3. Secret Voyages to the New World, pp. 154, 162, 164-5. 5. Patrick Huyghe, Columbus Was Last: From 200,000 B.C. to 1492; a heretical history of who was first, San Antonio, TX: Anomalist Books, 1992, pp. 145-68. 6. Earl Koenig, ‘Inca skeleton unearthed in Scandinavia’, in Unearthing Ancient America, pp. 245-6. 7. Earl Koenig, ‘Did a sunstone guide the Vikings to America?’, in Unearthing Ancient America, pp. 207-10. 8. Columbus Was Last, pp. 169-81. Tomb paintings and writings show that the Egyptians were trading down the Red Sea and into the Indian Ocean before 2000 BC – voyages as long as Columbus’ crossing of the Atlantic. They made regular excursions to Lebanon before 2500 BC for cedar. During the reign of female pharaoh Hatshepsut (1503-1482 BC), ships 90 to 100 feet long were sailing to and from the Land of Punt – which has been variously identified as East or South Africa, America, India or Australia. The ship whose dismantled pieces were found buried in front of the Great Pyramid was 132 feet long. The Phoenicians, a trading people of the eastern Mediterranean, had ships averaging about 70 feet long, and sailed to Cyprus for copper, to the Iberian peninsula for silver, and as far as Cornwall in Britain for tin. They learned the secrets of simple telescopes or ‘spyglasses’ and of the magnetic compass. Minoan graffiti, dated to around 1700 BC, has been found at Stonehenge, very close to ancient Cornwall. A 14th-century BC, 50-foot merchant vessel roughly the size of Columbus’ Niña was found in 140 feet of water off Turkey. The cargo preserved in its hold – including copper, tin, blue glass, gold and silver jewellery, scrap metal, Baltic amber, bronze tools, and African exotics – represented eight cultures: Mycenaean Greek, Minoan, Phoenician, Cypriot, Egyptian, Kassite, Assyrian, and Nubian. The main sea traders at that time were the Minoans, Etruscans, Phoenicians, Libyans, and early Greeks, but they left few written records of their ships or commerce. Around 600 BC Phoenician mariners sailed south through the Red Sea and circumnavigated Africa’s Cape of Good Hope, returning through the Straits of Gibraltar three years later – a 13,000-mile journey that was many times longer than Columbus’ voyage. Numerous Celtic, Basque, Iberian, Phoenician, Egyptian, Berber, Libyan, Minoan, and Viking inscriptions have been found on rocks, tablets, and stone monuments all across the American continent. Epigrapher and prehistorian Barry Fell played a major role in identifying and deciphering some of these inscriptions.1 While his work has received some recognition from academics, particularly in Europe, most have displayed irrational hostility. They tend to reject the inscriptions as marks made by plough blades, tree roots or natural erosion, or as doodles left by Native Americans and early colonists. But as Fell pointed out, they failed to explain why ploughs in Pennsylvania usually write in Basque or Iberian Punic, whereas those of New England prefer to use Celtic Ogam! Fig. 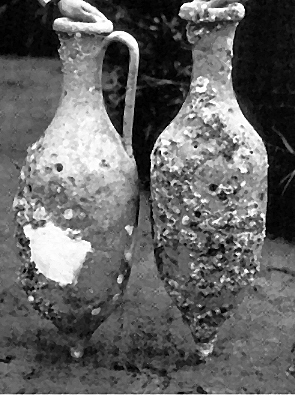 3.2 Roman amphorae brought up from the seabed at Guanabara Bay, Brazil.3 A complicating factor is that Américo Santarelli, an Italian diver living in Rio de Janeiro, revealed in a book published in 1983 that he had 18 amphorae made by a local potter, and had placed 16 of them at various places in the bay, intending to recover the encrusted amphorae later to decorate his house. To prove this, he recovered 8 of the amphorae.4 This led to all such finds being dismissed as fakes. Gunnar Thompson says that the Romans sailed to the New World in search of King Solomon’s mines, but instead found civilizations eager to trade indigenous products, metals, and plants for Old World tools, textiles, and wines. Enrico Mattievich argues that various Greek and Roman myths reflect a knowledge of South America.1 In addition to their other layers of meaning, myths and legends about heroes such as Heracles and Odysseus travelling to the underworld (Hades or Tartarus), located beyond the western ocean or below the earth, contain geographical details that could be derived from journeys to the Andean highlands along the Amazon river, and also the Marañón and Ucayali rivers from whose confluence it springs. These rivers correspond to the Styx (or Stige) or Acheron of Greek mythology, and the rainforest corresponds to the swamps of Hades. The gorge known as the Pongo de Manseriche (‘gateway of fear’), where the Marañón joins the Amazon, contains a landmark of white limestone rocks, which corresponds to the ‘white rock’ where the two great rivers of the underworld meet. Mattievich contends that transatlantic voyages by Mediterranean peoples such as Minoans, Creto-Mycenaeans, and Achaeans/Pelasgians ceased or became extremely rare around the start of the 1st millennium BC. Fig. 3.4 Left: The Lanzón, Chavin de Huantar. Right: The head on the opposite side of the statue. Fig. 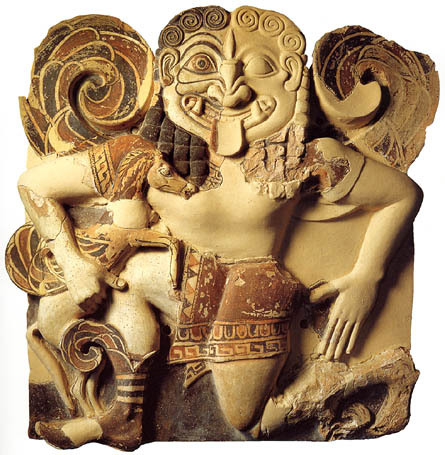 3.5 Gorgon from Syracuse (Sicily), 6th century BC. 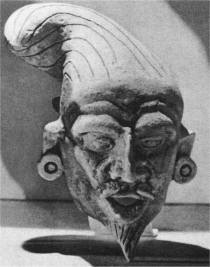 The facial features and the hair (with its six spirals) are very similar to those on the Lanzón. Fig. 3.7 Cast of the Grave Creek Stone. The coca leaf is native only to the Americas, and its presence in Egyptian mummies points to trading contact between the two continents. The tobacco plant is likewise indigenous to the Americas, but a wild form of tobacco also grows in parts of Africa. The words for tobacco smoking are similar on both continents, suggesting that, before the age of Columbus, either American visitors brought the tobacco plant to Africa or African visitors brought it to the Americas. In America the two oldest smoking pipes so far found were discovered in Brazil and Louisiana and date from about 1500 BC, just 300 years before stone smoking pipes appeared in northern Syria. As for hashish/marijuana, it originated in Central Asia. Fig. 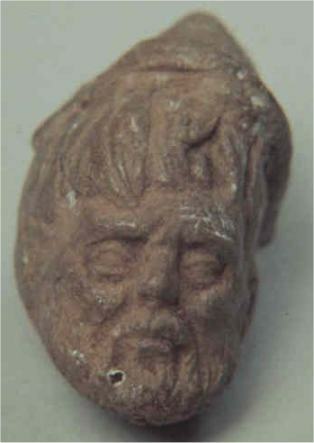 3.8 Egyptian statuettes found in El Salvador. Extensive copper mining took place in the Great Lakes region in the remote past. On Isle Royale, an island in Lake Superior, some 2000 ancient, open-pit copper mines are to be found, with over 5000 more extending for 1000 miles along the southern shores, on the Keweenaw Peninsula of Michigan. It is thought that mining may have begun as early as the 7th to 5th millennium BC, and that the major period of exploitation occurred between 3000 and 1200 BC. The later Indians, by contrast, were essentially a stone-age culture with few, if any, metal tools. Estimates of the total amount of copper mined range from 9000 to 680,000 tonnes, whereas all the Indian copper artefacts found in North American burials and caches do not exceed 4.5 tonnes. 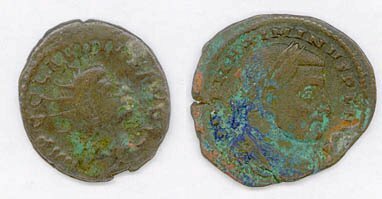 This suggests that a considerable volume of the high-grade copper was shipped overseas, perhaps to Bronze Age Europe.1 The Phoenicians/Egyptians, Minoans, Celts, and Norse could have taken some of the copper. 1. James P. Grimes, ‘The pre-Columbian connection: ancient transatlantic ships’, in Joseph (ed. 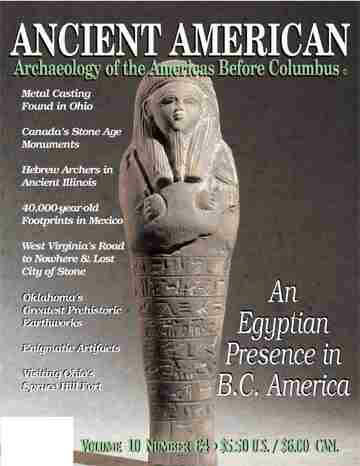 ), Unearthing Ancient America, pp. 225-34. 1. Barry Fell, America B.C. : Ancient settlers in the New World, New York: Pocket Books, 1989; Huyghe, Columbus Was Last, pp. 65-81. 2. America B.C., pp. 5-7. 3. Columbus Was Last, pp. 57-64. 4. 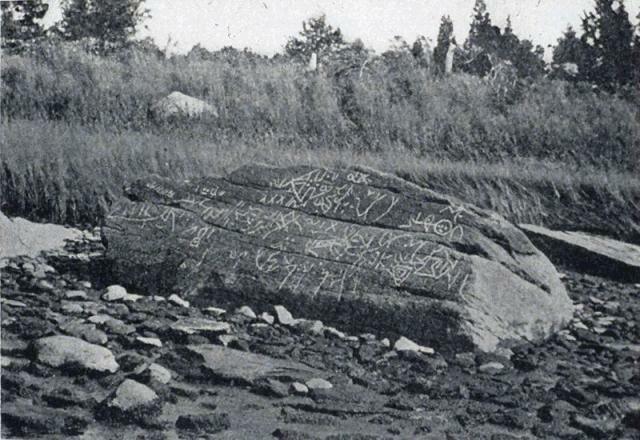 John Gallagher, ‘Dighton Rock: the ancient enigma of Massachusetts’, in Unearthing Ancient America, pp. 90-4. 1. Thompson, Secret Voyages to the New World, pp. 42-3. 2. Unearthing Ancient America, pp. 232-3; Andrew Collins, Gateway to Atlantis: The search for the source of a lost civilisation, London: Headline, 2000, pp. 147-50; Gary Fretz, ‘The first Europeans to reach the New World’, www.freerepublic.com/focus/f-news/1038045/posts. 5. 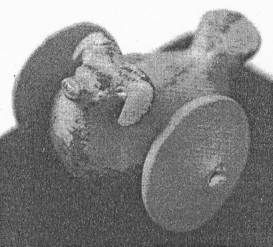 Lloyd Hornbostel, ‘A Roman-era figurine recovered off New Jersey’, in Unearthing Ancient America, pp. 141-3; Columbus Was Last, pp. 97-8; Gateway to Atlantis, p. 152. 6. J. Huston McCulloch, A few coin finds, 2001, www.econ.ohio-state.edu/jhm/arch/coins/coins.htm. 7. Secret Voyages to the New World, p. 43. 1. Enrico Mattievich, Journey to the Mythological Inferno: America’s discovery by the ancient Greeks, Denver, CO: Rogem Press, 2010. 2. Ibid., pp. 25-7, 62-70. 1. Columbus Was Last, pp. 98-100. 2. J. Huston McCulloch, The Bat Creek Stone, 2005, www.econ.ohio-state.edu/jhm/arch/batcrk.html. 3. Wayne May, ‘The lost inscription of Grave Creek’, in Unearthing Ancient America, pp. 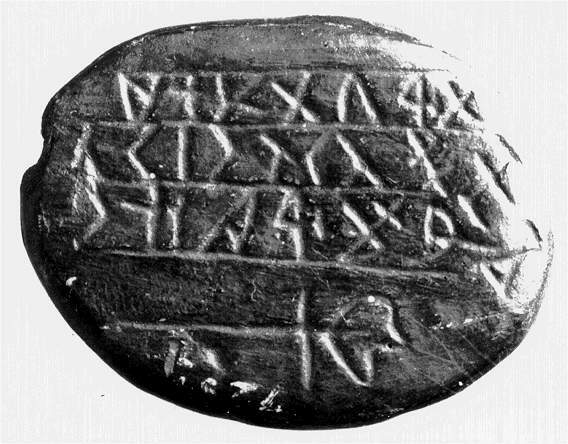 45-9; Ida Jane Meadows Gallagher, ‘The Grave Creek Tablet is genuine’, in ibid., pp. 50-3; J. Huston McCulloch, The Grave Creek Stone, 2008, www.econ.ohio-state.edu/jhm/arch/grvcrk.html. 1. Gateway to Atlantis, pp. 115-26; John L. Sorenson and Carl L. Johannessen, ‘Scientific evidence for pre-Columbian transoceanic voyages to and from the Americas’, Sino-Platonic Papers, no. 133, 2004, pp. 10-11, 13, 99, 134-7. 2. Secret Voyages to the New World, pp. 16-17, 26-7; Rick Sanders, ‘Where is Punt, the “Land of God”?’, 21st Century Science & Technology, spring 2009, pp. 54-7. 3. 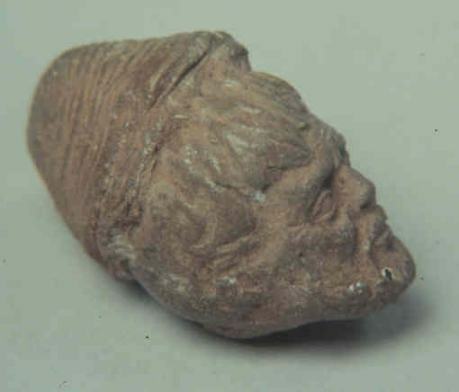 Wayne May, ‘An ancient Egyptian statuette found in Illinois’, in Unearthing Ancient America, pp. 13-24. 1. Robert M. Schoch, with Robert Aquinas McNally, Voyages of the Pyramid Builders: The true origins of the pyramids from lost Egypt to ancient America, New York: Tarcher/Putnam, 2003, pp. 130-1. 2. Secret Voyages to the New World, pp. 35-6. 3. Gateway to Atlantis, pp. 145-6. 1. W.R. Corliss (comp. ), Ancient Infrastructure: Remarkable roads, mines, walls, mounds, stone circles, Glen Arm, MD: Sourcebook Project, 1999, pp. 109-13. 2. Fred C. Rydholm, ‘An achievement to rival the pyramids’, in Unearthing Ancient America, pp. 114-23; Gregory L. Little, John Van Auken & Lora Little, Mound Builders: Edgar Cayce’s forgotten record of ancient America, Memphis, TN: Eagle Wing Books, 2001, p. 73; David Hatcher Childress, Lost Cities of North & Central America, Stelle, IL: Adventures Unlimited Press, 1992, pp. 375-6. 1. ‘Scientific evidence for pre-Columbian transoceanic voyages to and from the Americas’, p. 1. 3. Ibid., pp. 41, 44, 196, 203. 4. Ibid., pp. 11-12, 100-11; Voyages of the Pyramid Builders, pp. 128-30. Massive cultural transfers between Asia and the Americas seem to have taken place, particularly from the beginning of the 1st millennium BC until the end of the 1st millennium AD. Patrick Huyghe says that these transfers involved ‘everything from art styles and motifs to calendars, from counting devices to board games, to plants, papermaking and more ... A mere list of the parallels would take several pages.’ These cultural items tended to make their first appearance in the New World along the west coast of the Americas, from Alaska to Peru. According to Gavin Menzies, Admiral Zheng He landed with a flotilla of Chinese ships along the Pacific coast of North America in 1421.1 But it appears he was merely the latest in a long line of Chinese voyagers who crossed the Pacific, and that such journeys go back to at least the early 3rd millennium BC. While Chinese scholars are at least open to the possibility of transpacific voyages from their country, North American archaeologists are rather less enthusiastic. 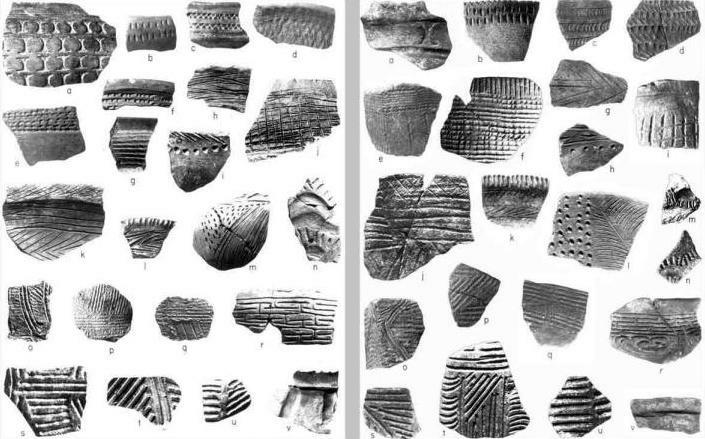 Apart from Norse claims of landfall in Newfoundland around 1000 AD, the only other claim that mainstream science has shown some sympathy towards is a visit to Ecuador by a boatload of Japanese over 5500 years ago.1 Pottery appeared suddenly in the stone-age culture of the Valdivians around 3600 BC. It was a fully formed technology with an elaborate range of decorative techniques. The decorations changed over the next 2000 years, but became simpler rather than more complex. 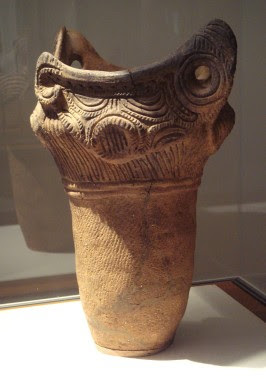 The pottery shows little or no connection with any earlier American pottery style, but is strikingly similar to that produced by the Jomon culture on the southernmost Japanese island of Kyushu during the same period. The number of stylistic similarities rules out independent invention. Even older pottery sherds have been unearthed below the Valdivia level. This San Pedro pottery, as it is called, falls within the range of variation of the Valdivia pottery and may have been made by the same potters. Excavations on the north coast of Columbia unearthed pottery sherds dated to 3800 BC. These, too, share traits with the Jomon period pottery, but resemble pottery found on Honshu, the largest Japanese island. The Polynesians on Rarotonga in the Cook Islands had a legend about a large expedition that sailed past Easter Island (Rapa Nui) to a land of ‘ridges’ – a possible reference to the Andes. A tradition from Mangareva tells of voyages to places called Taikoko and Ragiriri, representing the region of Cape Horn at the tip of South America and the Strait of Magellan. There is a legend in the Marquesas Islands about a very large double canoe that sailed east to a land called Tefiti – the only land to the east is the American continent. Fig. 4.4 Cashew nuts carved on the balustrade of the Bharhut Stupa. Only this sketch now remains of this part of the ruins. Fig. 4.5 Fruits of Annona squamosa carved on the same balustrade at Bharhut Stupa. According to Hindu tradition, Arjuna, one of the heroes of the Mahabharata, went to Patala (the Antipodes, i.e. America) 5000 years ago, and married Princess Ulupi, a daughter of Kauravya, the king of the Nagas.1 ‘Naga’ is Sanskrit for ‘serpent’, a name that (like ‘dragon’) was applied to sages and initiates. The Mexican Indians call their shamans ‘nagals’, several Central American deities and culture-bearers are depicted as feathered serpents (often dragonlike in appearance), there are Snake tribes among the North American Indians, and a gigantic Serpent Mound 420 metres long was constructed by the moundbuilding peoples of ancient Ohio. The Hindu Puranas and Jatakas describe epic sea voyages reaching as far as Malaysia and Indonesia. And before the 1st century AD, merchants from India were sailing to Siberia in search of gold.2 A relief carving from Borobudur’s Temple of the Niches in Indonesia shows a three-masted oceangoing galley about 100 feet long. There are Buddhist records of a 5th-century pilgrimage from Sri Lanka to Java on vessels large enough to carry 200 passengers, and it was not unusual for 9th-century crews to sail thousands of miles on the Indian Ocean. Fig. 4.6 The Michigan medallion. Another cultural complex found in both Southeast Asia and South America is the making of bark cloth. It is a highly intricate process involving 121 steps, of which 92 are the same in the Old World and New World. Of those 92, 42 do not depend on the prior step and are carried out in an arbitrary sequence, yet they are done in the same order in both areas.7 That such a coincidence could arise from independent invention is outside the realm of chance. 1. Huyghe, Columbus Was Last, pp. 82-3. 1. 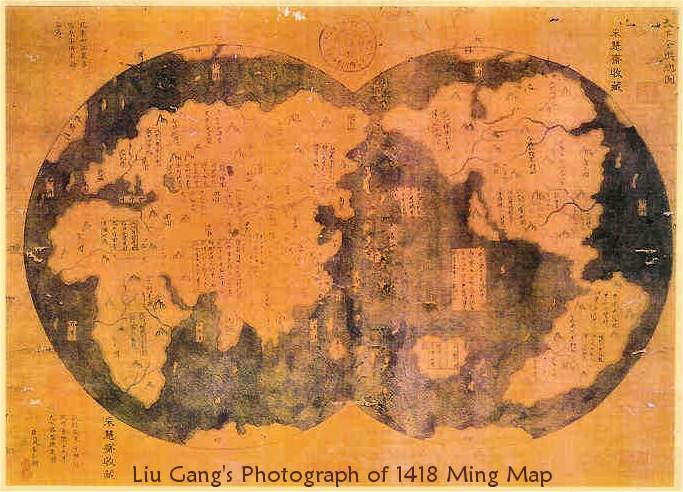 Gavin Menzies, 1421: The year China discovered the world, London: Bantam Press, 2002. 2. Columbus Was Last, pp. 36-45. 3. Thompson, Secret Voyages to the New World, pp. 53-73. 4. Columbus Was Last, pp. 113-23. 5. Secret Voyages to the New World, pp. 154, 166-9. 6. Little, Van Auken & Little, Mound Builders, p. 203. 7. Columbus Was Last, pp. 36, 93-4. 1. Columbus Was Last, pp. 28-35. 2. Edward Moreno, Chris you were late! – Part 2, www.discovernikkei.org/en/journal/2010/2/5/chris-you-were-late. 3. 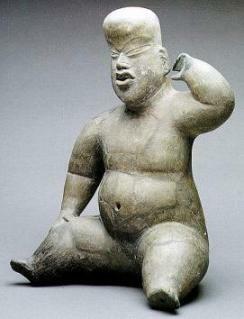 David Lee, The Jomon, Japan-Valdivia, Ecuador Case, [http://faculty.smu.edu/dfreidel/ANTH3334_Fall/PDFs/Part 2/Oct12.pdf]. 4. Schoch, Voyages of the Pyramid Builders, p. 147. 1. Sorenson and Johannessen, ‘Scientific evidence for pre-Columbian transoceanic voyages to and from the Americas’, pp. 12, 116-18; Columbus Was Last, pp. 109-10. 2. http://en.wikipedia.org/wiki/Pre-Columbian_trans-oceanic_contact; W.R. Corliss, Science Frontiers, no. 159, 2005, pp. 1-2. 3. W.R. Corliss (comp. ), Archeological Anomalies: Small artifacts, Glen Arm, MD: Sourcebook Project, 2003, pp. 209-10. 4. A. Hyatt Verrill, Old Civilizations of the New World, New York: New Home Library, 1942 (1929), pp. 12-13; www.britannica.com/EBchecked/topic/546589/Siriono. 1. ‘Scientific evidence for pre-Columbian transoceanic voyages to and from the Americas’, pp. 42-3, 199-200; Columbus Was Last, pp. 127-8. 2. John Gallagher, ‘An old map and some chicken bones terrify archaeologists’, in Joseph (ed. ), Unearthing Ancient America, pp. 222-5. 3. ‘Scientific evidence for pre-Columbian transoceanic voyages to and from the Americas’, pp. 13-14, 165-72; Voyages of the Pyramid Builders, pp. 137-40. 5. ‘Scientific evidence for pre-Columbian transoceanic voyages to and from the Americas’, pp. 9-10, 66-8. 6. Ibid., pp. 15-16, 59-60, 64-6, 211, 213. 7. Ibid., pp. 26, 124, 143-5. 8. Ibid., pp. 2-3, 172-4. 1. H.P. Blavatsky, The Secret Doctrine, TUP, 1977 (1888), 2:214, 628. 2. Columbus Was Last, pp. 123-4. 3. Frank Joseph, ‘Medallion puts Buddhists in Michigan a thousand years ago’, in Unearthing Ancient America, pp. 24-30. 4. Philip S. Harris (ed. ), Theosophical Encyclopedia, Quezon City, Philippines: Theosophical Publishing House, 2006, p. 31. 5. Voyages of the Pyramid Builders, pp. 147-8. Until the 1930s the Maya were thought to be the oldest civilization in Mesoamerica, but nowadays the Olmecs are believed to be the mother culture. The classical period for the Olmecs is said to be 1200 to 400 BC, but early Olmec artefacts date back to at least 1800 BC, and the earliest precursors of the Olmec style of art are observable 4000 years ago. The Olmecs went into decline around 400 BC, and were succeeded by the Epi-Olmecs, Zapotecs, Mixtecs, Maya, Toltecs, and Aztecs, who occupied many of the same sites. 17 colossal heads carved from single pieces of basalt have been found at four Olmec sites and are assumed to have been made by the Olmecs. 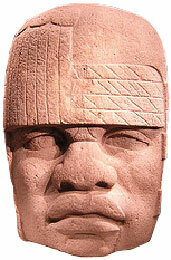 The Olmecs also built city-temple complexes, pyramids, and sophisticated drainage systems. 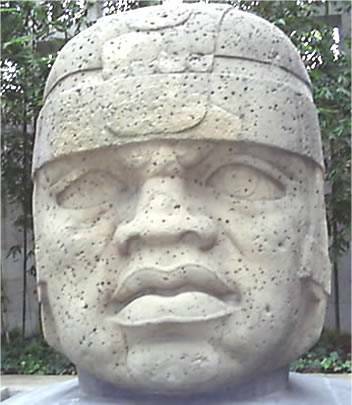 They invented the number, calendrical, and writing systems later refined by the Maya, and are credited with creating the ball game that played a significant role in all Mesoamerican civilizations, and which is now known to have profound astronomical and mythological meanings.1 ‘Olmec’ means ‘rubber people’ in the Aztec language, and is a reference to the rubber trees growing in the Olmec core area; the Olmecs are credited with discovering how to make rubber balls. The Olmecs also practised human sacrifice, and this bloodthirsty tradition was passed on to later Mesoamerican cultures, reaching its apex with the Aztecs. 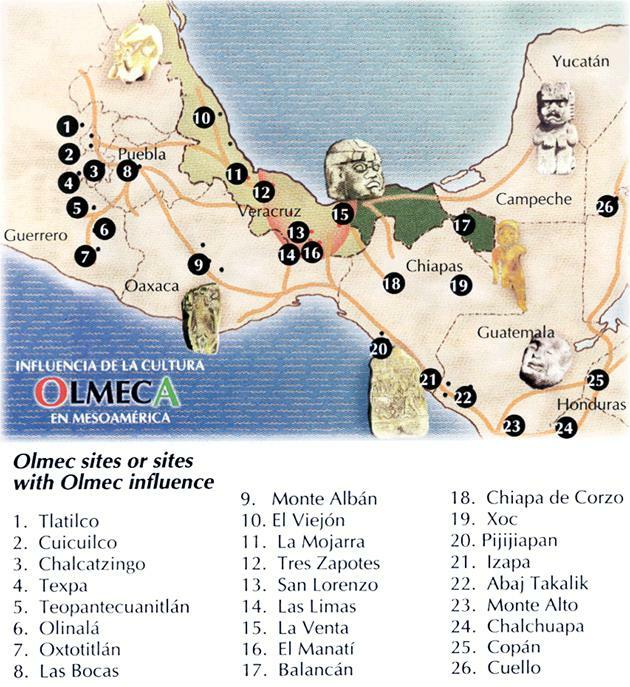 The Olmec heartland was located in the Mexican states of southern Veracruz and Tabasco on the Isthmus of Tehuantepec. But the Olmecs’ cultural influence extended over large areas of Central America, from Guatemala and El Salvador to Nicaragua, Costa Rica and beyond. The isthmus provides the shortest overland trade route between Atlantic and Pacific ports, and since transoceanic trade seems to have been very extensive for millennia, the Olmec homeland may have been a cosmopolitan centre where worldwide cultures intermingled. Olmec art and artefacts feature people with Negroid, Oriental, and European features, but orthodox academics insist that this is not evidence of ancient pre-Columbian explorers and traders. In fact, they believe it is ‘racist’ and ‘insulting’ to suggest that Central Americans were influenced by other cultures. Apparently it is not ‘racist’ and ‘insulting’ to insist that ancient cultures were incapable of transoceanic travel! Fig. 5.2 Monument number 13, originally from La Venta, shows a bearded man wearing a turban who looks more like a Phoenician than a Mexican. The turned-up shoes he is wearing were worn in three Mediterranean civilizations: Etruscan, Hittite, and Phoenician. The native peoples of Central America were incapable of growing substantial facial hair. The famous basalt heads range in height from 1.5 to 3.4 m and weigh up to 50 tonnes. How they were carved out of such hard rock and transported over 80 km to their final destinations is unknown. 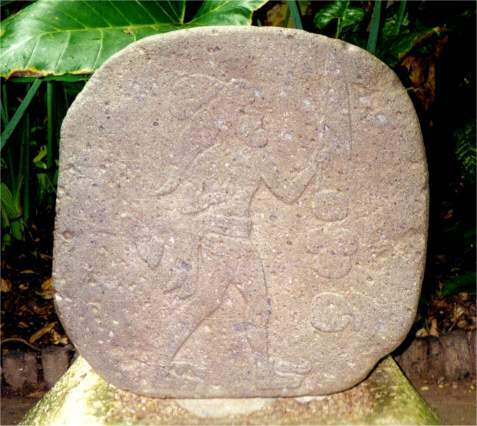 Modern attempts to move similar rocks over land with the technology thought to have been available to the Olmecs failed even over quite short distances. And attempts to move such rocks over water failed because the rafts and boats sank. 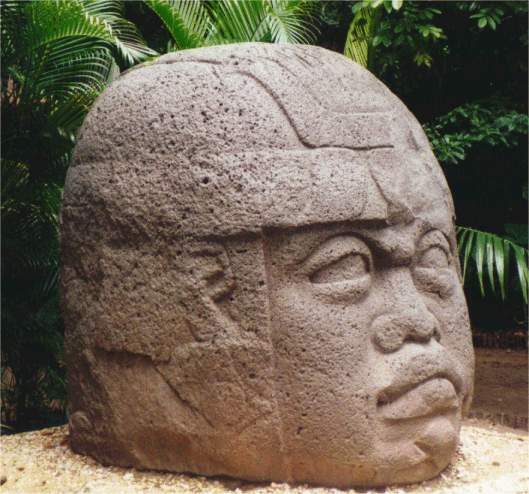 The sculptures have broad faces, wide cheeks, thick lips, flattened noses, braided hair, a distinctive scowl, and are wearing helmets. 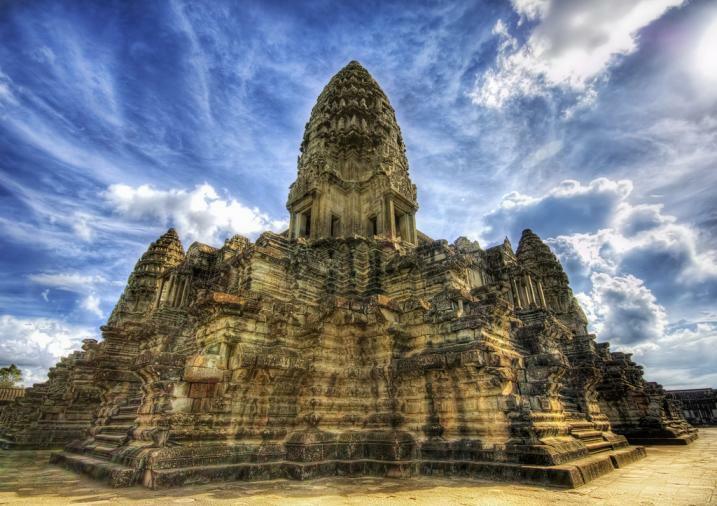 They once stood in large squares in front of temples and ceremonial platforms and altars. Some researchers say they look like West Africans. Others note that some heads have the characteristic Asian eyefold. The statues faced east, looking toward the nearby Atlantic, and Africa. It is thought they might represent gods, revered ancestors, or priest-kings dressed for the ritual ball game. Fig. 5.3 ‘Olmec’ basalt heads. Fig. 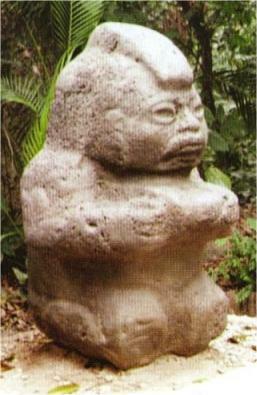 5.4 This Olmec statue is one of ‘the twins’, from Azuzul, Veracruz. Note the unusual Egyptian-type headdress and curious box on his forehead. This is similar to Hebrew-Phoenician customs, with the box holding magical writings or parts of the Torah. 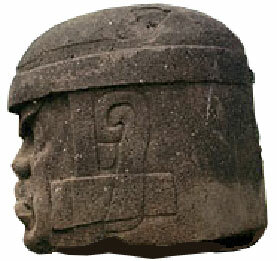 Patrick Huyghe says that the kettle caps worn by the Olmec basalt heads are helmets of power, and resemble the helmets worn by Nubians and Egyptians of that era. The cultural impact of the Nubian-Egyptians is especially evident in the royal and priestly dress and emblems of power of the Olmecs. A whole constellation of traits – the double crown, sacred boat, artificial beard, feathered fans, and ceremonial umbrellas – appears in both civilizations. But perhaps the most significant shared trait is the use of the color purple. The Egyptians, who were supplied with purple dye by the Phoenicians, were among the first to associate purple with religion. They used it to distinguish priests and royalty. 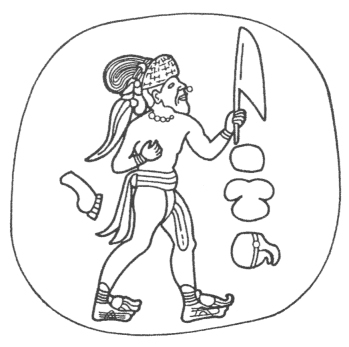 appearance with beard and moustache from Tres Zapotes, Veracruz. Fig. 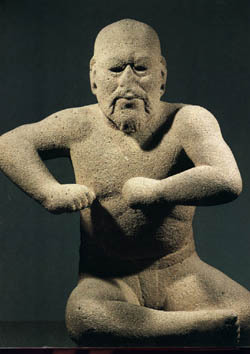 5.6 Oriental-looking statue known as ‘the wrestler’ from Uxpanapan, Veracruz. 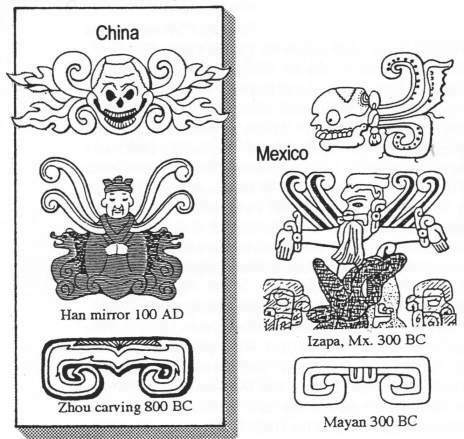 There appears to be a strong link between the Olmecs and the Shang civilization of China (1600-1046 BC). 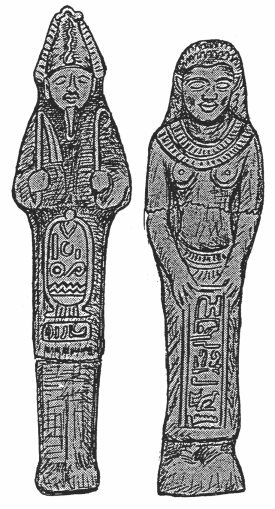 The similarities include their writing styles, the use of jade, the use of batons as symbols of rank, their settlement patterns and architectural styles, the possession of feline deities, and the use of cranial deformation (head-flattening). 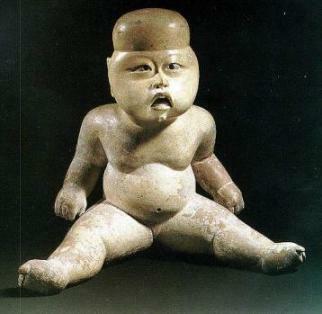 The artificial deformation of infants’ heads was also practised by the Maya, the Aztecs, the ancient Peruvians, the Flathead Indians, the ancient Egyptians, the Easter Islanders, the Cro-Magnon Aurignacian culture, the Basques, and the Indians of the Antilles. The practice was used to denote elite status, to emphasize ethnic differences, or for religious, magical, or aesthetic purposes. Some Olmec hieroglyphs look very like Chinese characters. 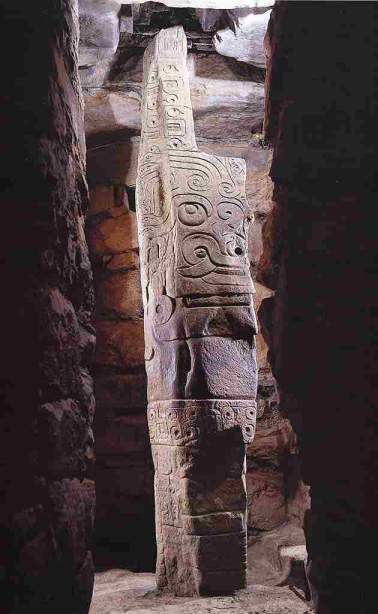 One Chinese language scholar has argued that the Olmecs used the early Shang oracle script for a time, which later evolved into the Epi-Olmec script and possibly the Mayan script.5 Others argue that the Olmec script was brought from western Africa or developed locally. Fig. 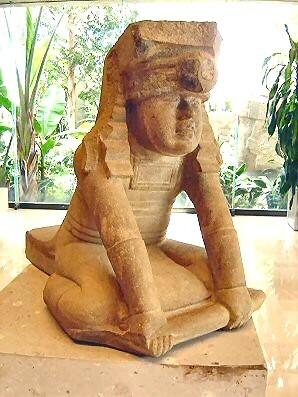 5.7 Olmec (left) and Shang (right) statues with mohawk haircut in a kneeling (quizuo) position. This hairstyle was also worn by the Columbians, Africans, and Mohawk Indians of the St Lawrence river. In China it is associated with ancient magicians. The Olmecs often depicted human heads with a V-shaped cleft in the top of their heads. This may symbolize the crown chakra (linked to the pineal gland) – one of the main points where energies from subtler levels of our being enter the physical body. 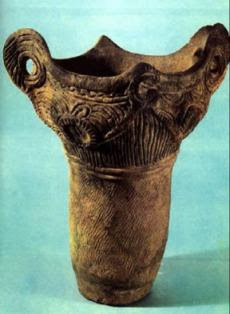 John Major Jenkins says that it symbolizes a portal to another realm, a birthplace, and – astronomically – the dark rift, a cleft-like feature in the Milky Way near one of the points where it crosses the ecliptic, close to the direction of the galactic centre.8 The cleft-head motif is also found in Chinese art. Fig. 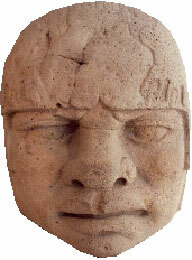 5.10 Left: Olmec cleft-head motif (900-600 BC). Right: Ancient Chinese cleft-head motif (4000 BC).10 In modern images of the Buddha the crown chakra and its radiance are sometimes represented by a protuberance (ushnisha) at the top of the head. Both the cleft and protuberance can be seen in the above figures. The stones balls discovered in Costa Rica are another intriguing mystery associated with what was once Olmec territory. There are several hundred such balls, ranging from a few centimetres to 2.15 metres in diameter. Nearly all of them are made of granodiorite, a very hard, igneous stone. The balls were cut, trimmed and then polished. 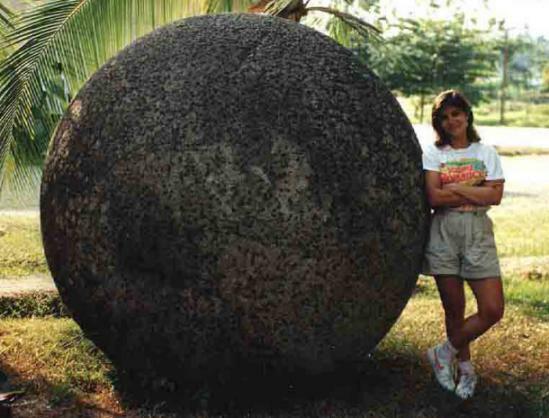 The largest balls, which weigh about 15 tonnes, show the finest craftsmanship. The official view is that they were all made with primitive tools, beginning no earlier than 200 BC.11 Their true purpose and origin are unknown. Fig. 5.11 Stone ball, Costa Rica. Fig. 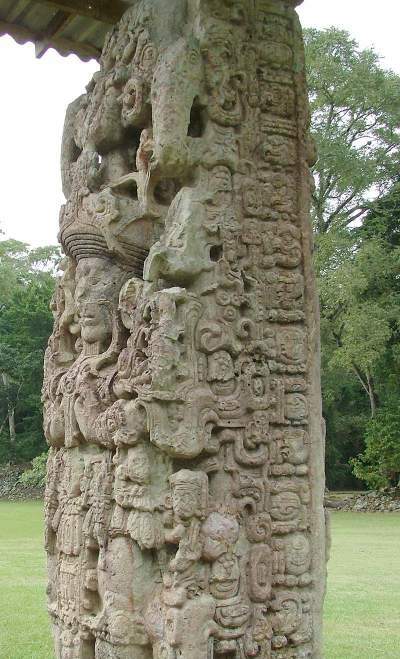 5.12 Izapa stela 5 – the Festival Monument. Fig. 5.16 Mason marks seen on Comalcalco’s bricks (left) strongly resemble those used by Roman masons (right). Fig. 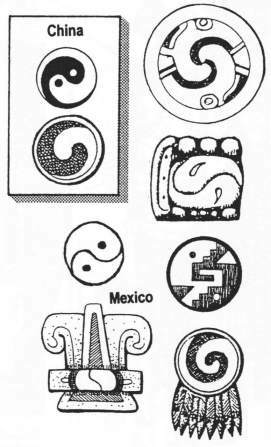 5.17 Christian motifs common in ancient Europe (top) are similar to motifs at Comalcalco (bottom). Fig. 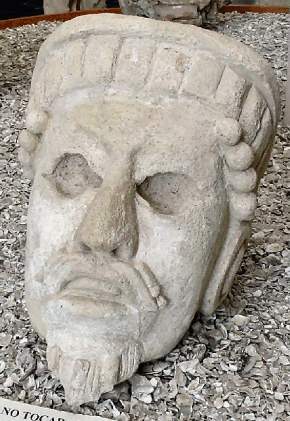 5.18 This ceramic head recovered at Comalcalco suggests a Roman or Afro-Arabian influence. Fig. 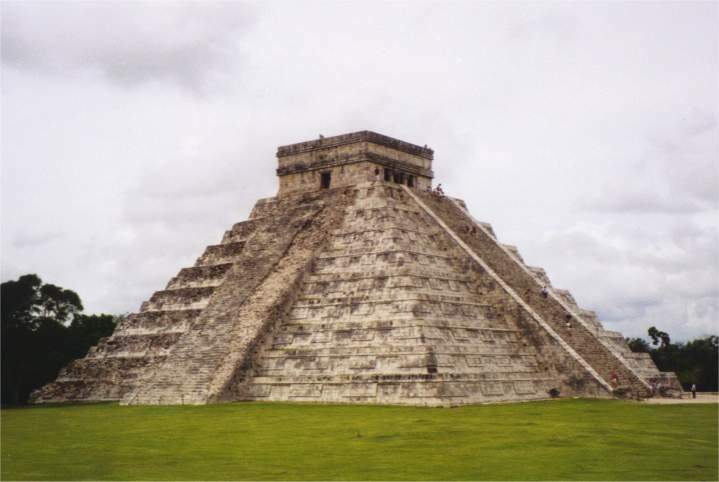 5.21 Pyramid of Kukulkán, Chichén Itzá, Mexico. 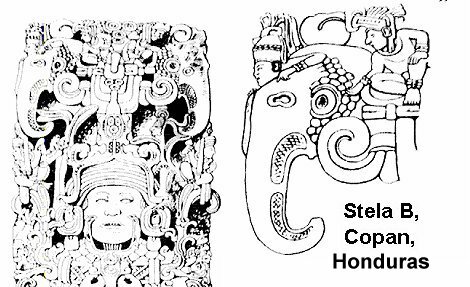 An impressive piece of evidence for an east Indian presence in Mesoamerica is the 8th-century stela of a Mayan noble from Copán, Honduras. At the top of the stela are what appear to be two elephant figures – which are remarkable because elephants were not indigenous to America. Conventional scholars insist that the long-nosed animals are local tropical birds with enlarged beaks – perhaps tapirs or macaws. The figures mounted on the ‘elephants’ (no longer visible today) are wearing turban-like headdresses resembling the headgear of Hindu elephant riders, or mahouts, of the same period. A long-nosed figure looking like Ganesha, the Hindu elephant-headed god, also appears on the stela.16 Ganesha was particularly worshipped by Indian traders and merchants. Fig. 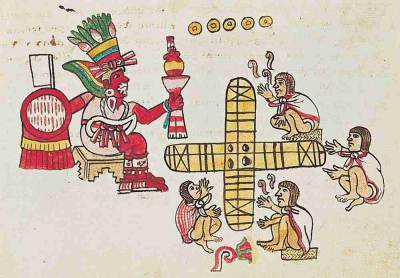 5.24 Patolli board game (Codex Magliabechiano, Central Mexico, 16th century AD). Fig. 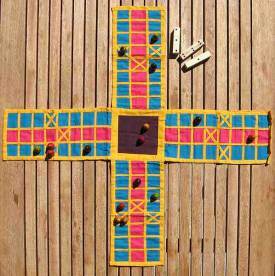 5.25 Modern pachisi board game in India. Fig. 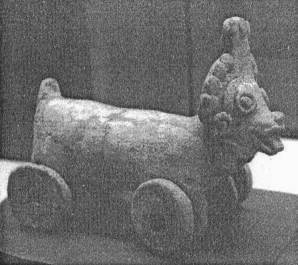 5.26 A wheeled ‘toy’, exhibiting elements of the native Mexican dog, which was the same species found in ancient China (El Tajin, Veracruz, east coast of Mexico, 7th-9th century AD). 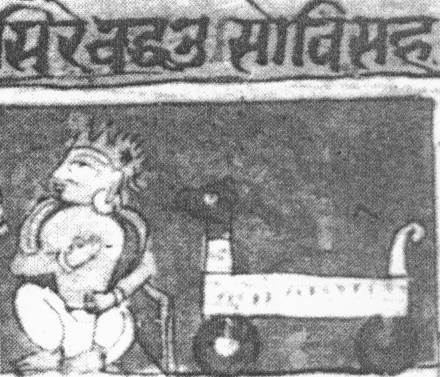 (Mahapurana, Palam, North India, 1540 AD). Fig. 5.28 Left: ‘Mythical’ creature which appears to depict a ram’s head and horns (Cholula or Tezcala, Central Mexico, 7th century AD). 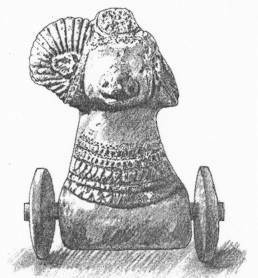 Right: Model of a ram with one horn still attached (Chandraketugarh, West Bengal, Northeast India, 1st century BC). In mural paintings the Maya depicted themselves as lighter skinned than their enemies, and their rulers and nobility were portrayed as having the lightest skin of all. A scene in the Temple of the Warriors at Chichén Itzá depicts people with white, brown, and black skins. 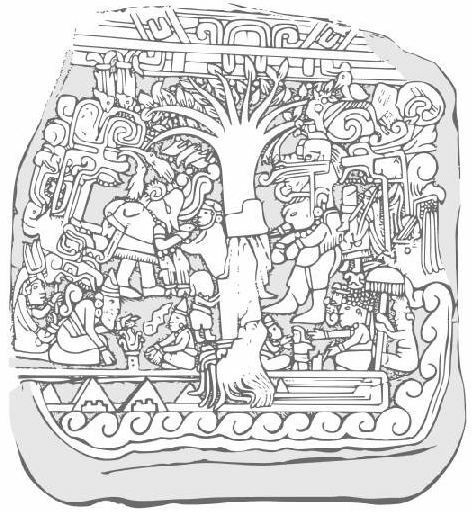 The Popol Vuh, the sacred text of the Quiché Maya, describes the first ancestors as ‘black people, white people, many were the people’s looks, many were the people’s languages’. 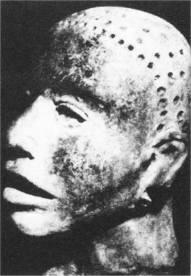 Many of the mummies of the Inca nobility of Peru also bear strikingly Caucasoid traits. 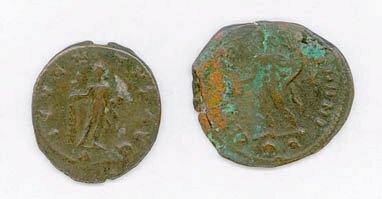 The use of metals in Mexico has been pushed further and further back, and is now virtually contemporary with that in South America, where sophisticated metalworking techniques were developed around 1200 BC. The Olmecs had a word for metal as early as 1500 BC, and mined iron, jade, turquoise, obsidian, emeralds, and gold. Many of the Aztec, Toltec, Mayan, and Zapotec mines may have originally been Olmec mines. Jade was the most valuable of all stones to the ancient Chinese and also to Mesoamerican cultures. 1. John Major Jenkins, Maya Cosmogenesis 2012: The true meaning of the Maya calendar end-date, Rochester, VT: Bear & Company, 1998, pp. 127-38. 2. Collins, Gateway to Atlantis, pp. 132-3. 3. Huyghe, Columbus Was Last, p. 189. 4. Ibid., pp. 186, 188. 5. David Hatcher Childress, The Mystery of the Olmecs, Kempton, IL: Adventures Unlimited Press, 2007, pp. 209-11. 7. W.R. Corliss (comp. ), Archeological Anomalies: Graphic artifacts I, Glen Arm, MD: Sourcebook Project, 2005, pp. 99-101. 8. Maya Cosmogenesis 2012, pp. 9-10, 131-2, 202. 9. The Mystery of the Olmecs, p. 196. 1. Thompson, Secret Voyages to the New World, pp. 63-5, 70, 73. 2. Columbus Was Last, p. 90. 5. Columbus Was Last, pp. 90-1; Secret Voyages to the New World, pp. 64-5. 7. Columbus Was Last, p. 123. 8. Secret Voyages to the New World, pp. 67-9. 9. Schoch, Voyages of the Pyramid Builders, pp. 149-52; W.R. Corliss (comp. ), Ancient Structures: Remarkable pyramids, forts, towers, stone chambers, cities, complexes, Glen Arm, MD: Sourcebook Project, 2001, pp. 152-9. 10. Gateway to Atlantis, pp. 150-2; The mystery at Comalcalco, http://mexicolesstraveled.com. 12. Voyages of the Pyramid Builders, pp. 148-9; Ancient Structures, pp. 137-9. 14. Ancient Structures, p. 162. 15. Graeme R. Kearsley, Mayan Genesis: South Asian myths, migrations and iconography in Mesoamerica, London: Yelsraek Publishing, 2001, pp. 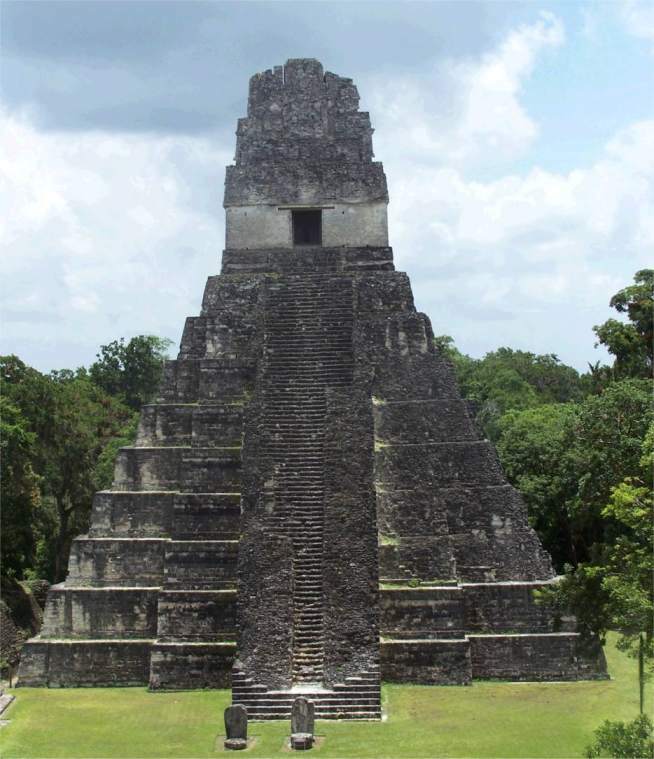 80-4, 144-52; 2012 and the Mayan calendar, Mythological connections, http://davidpratt.info. 16. Columbus Was Last, pp. 125-6. 19. Mayan Genesis, pp. 296-7, 962-3. 20. Ibid., pp. 221-2, 964-6. 21. Dorothea Chaplin, Mythological Bonds between East and West, Copenhagen: Einar Munksgaard, 1938, pp. 35-6, 68-9; Nicholas de Vere, The Dragon Legacy: The secret history of an ancient bloodline, San Diego, CA: Book Tree, 2004, p. 208. 1. 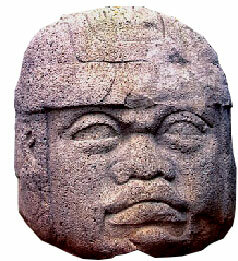 The Mystery of the Olmecs, pp. 227-37. 2. Secret Voyages to the New World, p. 66. 3. Corliss, Archeological Anomalies: Small artifacts, pp. 269-70.